69 In Stock Assorted colour / Surprise me! 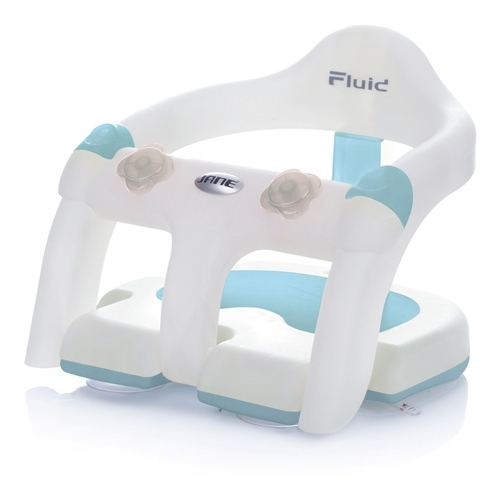 This latest deluxe version of the most popular Jané bath ring seat is specially made with even softer materials and a new non-slip inner that’s not only more secure but more comfortable against your baby’s precious skin. 100% soft; specially lined with material that’s non-slip and soft against baby’s skin. Materials: polycarbonate plastic. EVA seat and backrest. Phthalate free. Foldable so it can be stored away without taking up space. With front opening, so the child can be seated and taken out more easily, without hurting his legs. Includes recommended water level marks to guarantee the child’s safety in the bath. With toys on the front for the child to have fun in the bath. My daughter is 6.5months and is a bit wobbly still when sitting so she needs support from me at present as she slips down and slumps in it. It works well when she does lean forward she can play with her hands and interact with her older sister which she loves. The drop down front helps very much getting her out, it folds down which makes it easier to take to grandparents etc. It is more expensive than other bath seats on the market but is worth it. Ordering and delivery excellent. I did some research, this item v the swivel bath seats, this in my opinion is far superior. My baby is 6 and a half months old and on the large size, weighing over 21lb. The front acts a flap so baby can enter and exit easily leaving no marks to legs where you have to lift them out through the leg holes. Looks great. The leg area is of much better quality than alternatives hence no sore thigh marks on my baby from rubbing whilst seated (I felt alternatives and they were quite sharp). Seat section (where baby sits) is of a material so baby does not slide. Suction pads great, no movement in bath. I have recommended to all my friends. I think a must, yes slightly more expensive than alternatives but more than worth it and think will last years. Not tried other positions other than sitting but can recline and be stored flat, so would travel well. Brought this product so I can bath my 7 month old hands free without worrying that she may fall or turn over in the bath. It's great because you can fill the bath water pretty deep without worrying and my daughter loves sitting up in it and playing with her bath toys. I can now wash her hair with two hands and not be as paranoid about turning my back to her for a few seconds as Shes not going anywhere. Easy to get her in and out and doesn't hurt her legs at all as I've read that other bath seats do. Good morning. What is the weight limit for this product?